William Guthrie Spence was one of the most influential and enigmatic Australians of his era. From the 1880s through to the first World War, he was at the forefront of the labour movement and progressive politics in Australia. He was general secretary of the Amalgamated Miners' Association of Victoria from 1882 to 1991, and was appointed foundation president of the Amalgamated Shearers' Union of Australasia (ASU) in 1886. 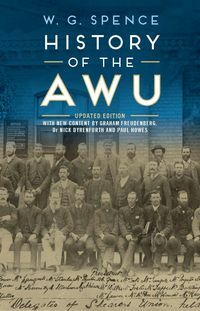 In 1894 the ASU merged with the General Labourers' Union to form the AWU. Under his leadership, the AWU developed close ties with the Australian Labor Party. Spence had a lasting influence on the ethos of the AWU, defining its values as 'moderate and conciliatory but firm', and focused on a practical agenda for the betterment of its members.Paul Howes is national secretary of the AWU and vice-president of the Australian Council of Trade Unions. He is a member of the national executive of the Australian Labor Party and represents the Asia-Pacific Region as a member of the executive committee of the International Metalworkers' Federation. Paul lives in Sydney with his wife and three children.Graham Freudenberg has been working with Australian Labor leaders as speech-writer and adviser for more than fifty years. After ten years in newspaper and television journalism, he was appointed Press Secretary to the Leader of the Federal Parliamentary Labor Party, Arthur Calwell, in 1961, aged 27. Since then, he has worked with Gough Whitlam, Bob Hawke, Neville Wran, Barrie Unsworth and Bob Carr. He was made life member of the Australian Labor Party (New South Wales Branch) in 2005.Dr Nick Dyrenfurth is the author or editor of several books on Australian labour and political history, as well as having published widely in leading academic journals. Nick has also written widely in the Australian pressm having frequently contributed to The Australian and The Age newspapers as well as The Monthly magazine.